Shhhh. Come over here. Are your kids in the other room? OK, good. We have a secret to share with you. Santa...is more of a position than a man. Meaning, when one Santa goes, his role gets filled by a new "Santa." And this is how the magic of Christmas continues for generation and generation. So how does a new Santa get selected, you ask? Well, one is chosen from an elite group known as the "Santa's Helpers." The training to become an official Santa's Helper is rigorous—think somewhere between hazing rituals and becoming a Navy SEAL. There are high-skill gingerbread tournaments, speed-gift-wrapping drills, TONS of reindeer games. 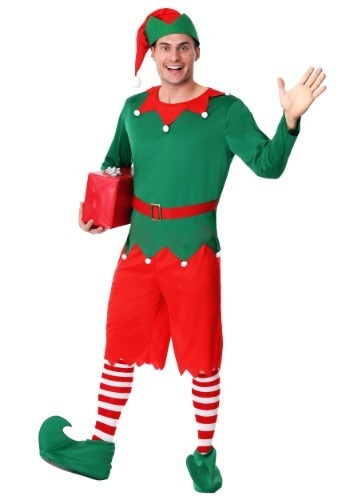 Getting to wear the uniform—this Men's Santa's Helper Costume—is a huge honor, and shows you bested the competition to become a highly-trained elf...who might just be next in line to the North Pole throne! Good luck! The design of this exclusive costume was overseen by Santa himself, and as such, was made regulation jolly-making by our costume studio! It comes with the green shirt with a red jester collar and a jagged hem, trimmed in white pom poms. The red britches matches the belt, collar, and hat, while the green shoe covers give your feet that perfect elfish curl at the toes that's expected of your role. We're not in any position to decide, but we'd definitely promote you in this costume—you look ready for the joys (and pressures) of the season! Just remember, if you're selected to take over THE biggest job on the planet, your success is all about how you choose to wield your power. Treat the elves fairly, find new ways to innovate, and definitely recycle and take care of the planet. The next Santa will need new tools and tricks to keep the holiday jolly for new generations.